This is my latest section of benchwork. 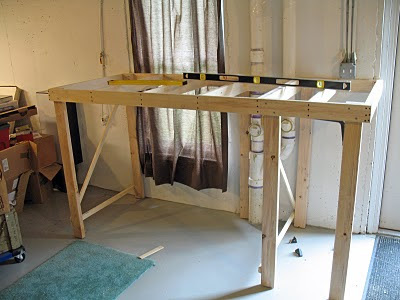 I have been wanting to build some benchwork out of 3/4 inch plywood because I am tired of picking over the lumber pile, even the premium lumber pile, to find straight dimensional lumber. I've have been dragging my feet building new benchwork until I could try this experiment; now that I have, the experiment has had decidedly mixed results. People have written about how they have had their lumber yard rip a sheet of 3/4 in. ply into 3 1/2 or 4 inch strips. Call around as I might, I could not get any yard to rip the sheet for me. So I picked up a sheet of ply at Home Depot (this could be my first mistake) and ripped it myself. I do not have a table saw, so I set-up and ripped each strip using a circular saw and a saw guide. This resulted in some annoying dimensional differences between strips. Furthermore, each strip had two beveled, not square, edges where the hand-guided saw tilted beyond 90 degrees. Worse still, as each strip was cut free, it immediately curled!! WTF!! This was not what I had expected. I stopped cutting after about half of the sheet was consumed. It produced a number of wide strips plus two 1 1/2 inch strips for leg braces. The legs of the benchwork would still be premium 2x4s. I placed the strips on the basement floor for over a month in the hope of straightening them out - no luck, they were still curled, although not as much. The strips were every flexible, so I believed, rightly, that they could be built into a reasonably square structure; but their utility over dimensional lumber was fading rapidly. The strips were very lightweight, which also did not bode well. When the basic frame structure was assembled it was light but not very rigid at all. 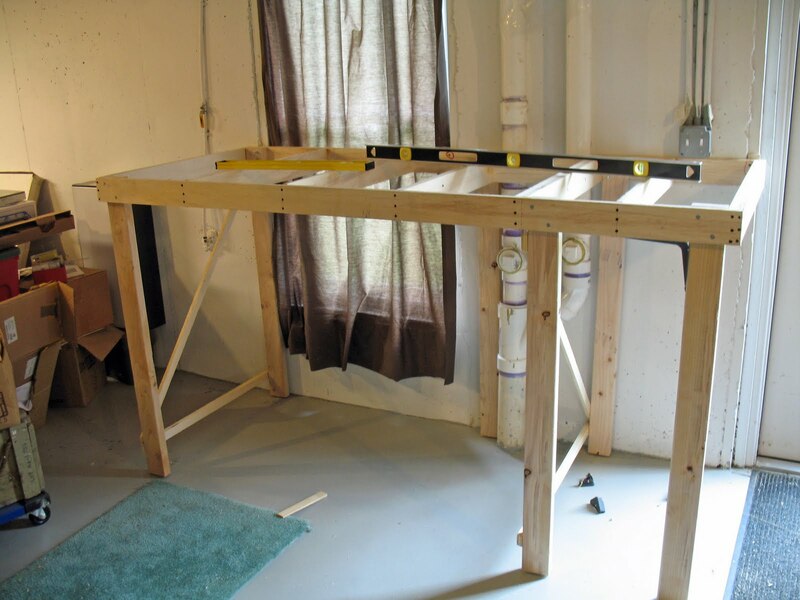 When the legs were attached and the benchwork attached to the concrete basement wall at three points, the structure was easily distorted with little pressure. The fact that the rearmost longitudinal member is a two-piece affair to fit around the drain pipes that you see in the picture probably did not help. The benchwork was more than strong enough to hold up the railroad, but at this location that was not enough. This section of benchwork is to the left of the basement walkout door and has to be rigid enough to maintain the alignment for the lift-out section to span the doorway. To salvage the section, I doubled up the rightmost two cross-members with 1x4 dimensional lumber to make it more rigid in the area where the lift-out section will attach. More leg cross-bracing was added to help stiffen this area, and the section will become more rigid when the benchwork sections to the left are added. These sections will be made out of conventional 1x4 lumber. If this is not enough I may add some cross-bracing in the plane of the grid to add stiffenss by the door. If all else fails, I may be able to hang the subroadbed from heavy-duty metal brackets attached to the wall thereby making the alignment independent of the benchwork altogether.